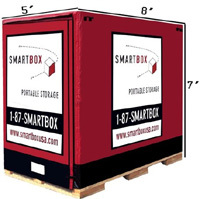 Portable Self Storage Ltl Orleans, MD | SMARTBOX of Maryland | Call Now! Ltl Orleans, MD’s Premier Provider of Portable Self Storage Solutions! Please use our use our online reservation form to tell us how many SMARTBOX containers you need, when you need them and where you would like to have them delivered to in Ltl Orleans, MD. Ltl Orleans, MD Portable Storage is the SMARTBOX advantage.